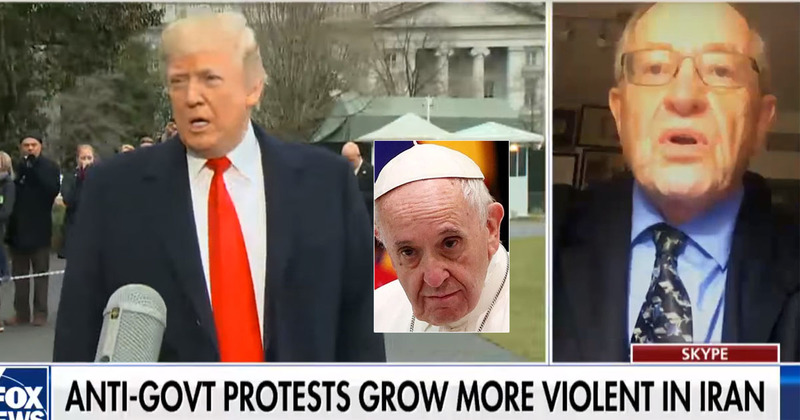 Dershowitz and Trump support the Iranians seeking to depose the tyrants in power while Pope Francis is still forcing his Islamic caliphate by population change upon the world. Alan Dershowitz is asked, in a Monday morning interview on the situation in Iran, if he believes President Trump’s tough stance helped lead to the protests. Maybe not. It appears that Francis is the chief offender among those Dershowitz was referencing. The Iranian people will get President Trump’s help in shaking off the yoke of Islamic tyranny, further providing the globalists of the world with a reason to despise and ridicule him, but none from Obama’s partner in crime, Pope Francis. For his part Francis issued his customary attack at the West in the form of a postcard of two child survivors of the blast at Nagasaki, absent any reminder that the Japanese were the aggressors. With his thinly-veiled attack on America Francis delivered more of his agitation for open borders, unrestricted immigration and a global Islamic government. It’s the very situation the Iranians are marching in the streets to reject. No wonder Francis has chosen to ignore that kind of negative press. Actions speak much louder than words, including the falsehoods spewed by an anti-American globalist hypocrite. In this instance the Democrat Dershowitz, by virtue of his honesty, is speaking a more virtuous message than the lying impostor residing in the Vatican. Big liar Obama and his sneaky money grubbing way to try and control the world and the US is being found out one bad move at a time. Obama is the one that should be sent back to Kenya, where he was born. He can take his transvestite wife and drug addict kids with him. We need to cut off his support. He is charging us millions to run all over the world and discredit the President and our country. He should be tried for fraud, the birther event, and stealing tax money and the uranium money from that deal. Also illegally tapping the phone in Trump Tower and leaking what he found to the media. Clinton should be prosecuted along with him. As for the Pope, I have never seen such a hypocrite. He is not a good Christian or Catholic. He should be locked up along with Obama and Clinton. Don’t forget the rest of the gang, Comey, Mueller, McCain, Porker, Rice, Lynch, Flake, Ryan and many more. When the say nasty things about the President, it should be noted and they should be prosecuted. I guess there might be some credibility to the opinion that the big 0bama was part of the push to remove the previous Pope. if people read the Bible it will be THE ROMAN CATHOLIC CHURCH WHO WILL HELP USHER IN THE ANTI-CHRIST. and this two bit SOB pope need a hole in his head.